Calchas; 7,639gt. L 463 feet. 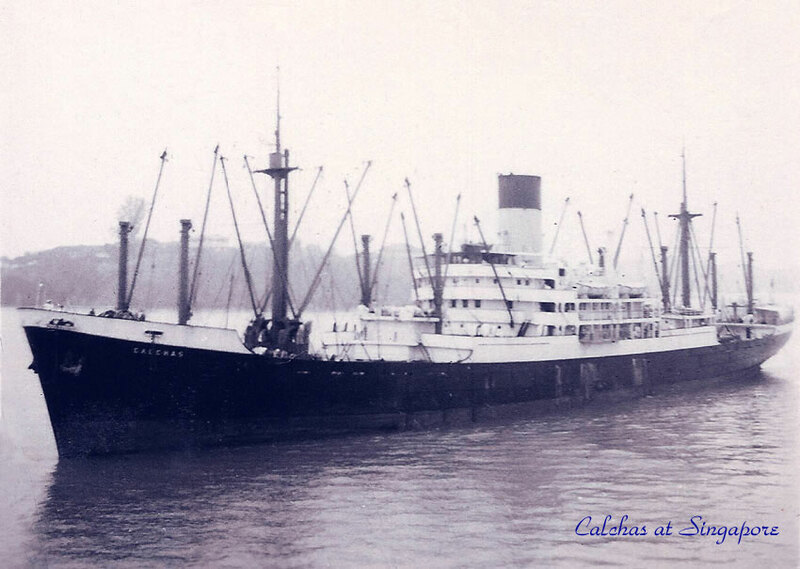 When the Calchas was launched at Belfast in 1947, she became the third Blue Funnel vessel to bare the name. Calchas (1) was 6,748 tons and built in 1899, she was torpedoed and sunk off Ireland in 1917. 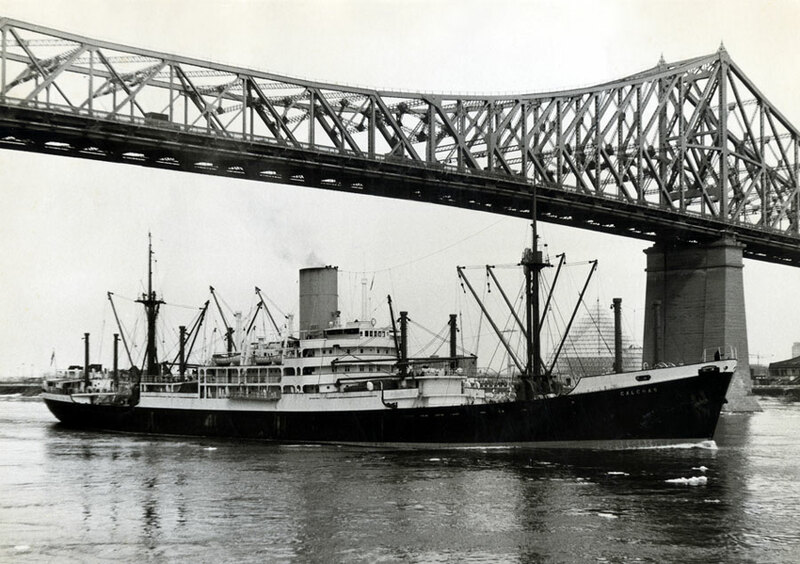 Calchas (2) built 1921, and at 10,304 tons, was the largest of the three, but sadly she was also torpedoed, and sank with the loss of 31 lives, off the Canary Islands in 1941. Calchas (3) was the first of the Blue Funnel "A" Class Mark I to be built, and was launched by the wife of Lawrence Holt a director of the company. For over eight years she was a cadet vessel, where most of her deckhands were replaced with 22 midshipmen, she also carried 14 engineer cadets. Calches moved to Glen Line in 1957 and renamed Glenfinlas. On her return to Blue Funnel she reverted back to her original name. In December 1971 she was transferred to Elder Dempster Line, but unusually for the Ocean group kept the name Calchas for several months, before adopting the E D's name Akasombo. 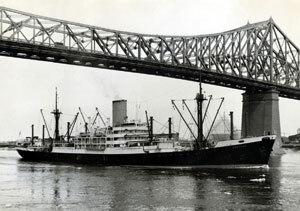 Calchas is pictured above, in Elder Dempster colours, as she sails under a bridge at Montreal, Canada, on the St Laurence river. She was the first salt water vessel to enter the Great Lakes, after the winter thaw of spring 1972. And as tradition would have, her master received a Bowler Hat and a walking cane, from the river authority, for being in command. She left the lakes as the "Akasombo" so this could well be the last photograph of her as the Calchas in E D's colours. By 1973, she was back in Blue Funnel on the Far Eastern run as the Calchas. And on July the 22nd while in Port Kelang Malaysia, loading rubber and latex, a petrol driven Forklift truck, fell down a deep-tank full of rubber and caught fire. 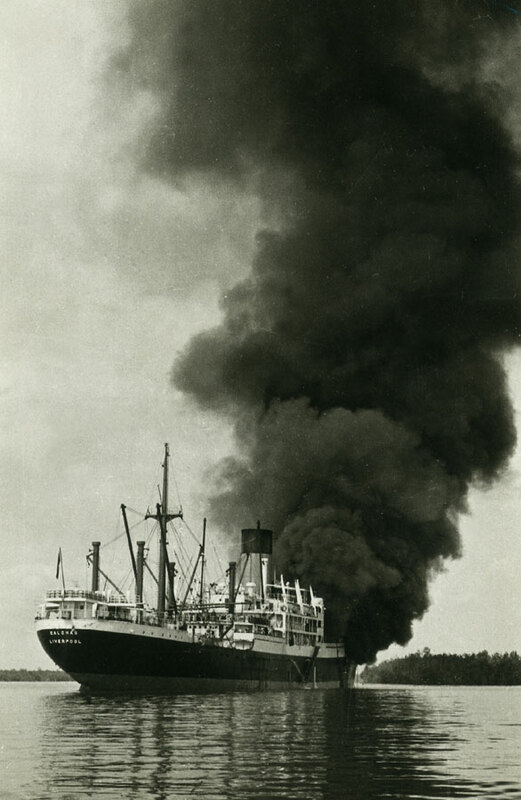 The resulting blaze rendered her a total loss, and she was towed to Singapore for demolition in November at the Kevn Hwa, Iron & Steel works, Enterprise Co Ltd. This fascinating and historically important photograph of her ablaze, was taken by Jerry Cartwright. He was Second mate on her at the time. Many thanks to Jerry, for lending me these two brilliant photographs.